^ Mark, Galeotti. Russia's War in Chechnya 1994-2009. 魚鷹出版社. 2014. ISBN 1782002774. ^ 徐, 振澤; 孫景源; 舒梓. 《俄羅斯恐怖事件根源及教訓：車臣之鑑》. : 第十節. ^ 4.0 4.1 4.2 4.3 滴血的領土 花絮 網友「永不言敗庫爾蘭」評車臣戰爭. ^ 5.0 5.1 Mark, Galeotti. Russia's War in Chechnya 1994-2009. 魚鷹出版社. 2014: 23. ISBN 1782002774. 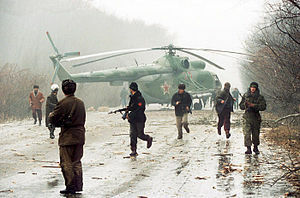 ^ Wounded Bear: The Ongoing Russian Military Operation in Chechnya 網際網路檔案館的存檔，存檔日期2010-01-02. ^ The Chechens and Urban Operations 網際網路檔案館的存檔，存檔日期2007-09-27.